GU @SMC on ESPN right now. Zags had an early lead, Gaels have pulled even. GU won at SMC 74-64. SCU won at UOP 64-47, after being tied at half. PU won at USD 65-60. BYU won at USF 68-52. LMU is the only team to win at home today. Might be relevant to some of the discussion on here: conference close game to blowout rankings. All other home teams won tonight. GU beat USF 96-61, with a big 2nd half. SCU beat PU 106-55! Kratch went for 32. Pilots almost assured the #10 slot; 2 back with 3 to play. #6 thru #9 are LMU and PU at 5-10, USD and UOP at 4-11. One of those teams will get the bye, one will play UP, and the other two will play each other. My prediction is that LMU will win 2 more and be the bye, PU will lose all 3, and USD will win one, and UOP will lose all 3. That would leave PU and USD tied for #7/8. Both of them beat BYU, and they split their games. The USD win over LMU might mean they play the Pilots back to back. Too bad, the Pilots have played best against LMU this year with 2 close losses, and I'd like another chance against the Lions. up7587 wrote: Too bad, the Pilots have played best against LMU this year with 2 close losses, and I'd like another chance against the Lions. Purple tinted glasses: I can remember times when we beat LMU twice in the season and then lost to them in the tournament. And, the other way around where we have lost to them (and Saint Mary's) twice in season only to beat them in the tournament. up7587 wrote: My prediction is that LMU will win 2 more and be the bye, PU will lose all 3, and USD will win one, and UOP will lose all 3. That would leave PU and USD tied for #7/8. Both of them beat BYU, and they split their games. The USD win over LMU might mean they play the Pilots back to back. Pepperdine beat LMU as well. I think Pepperdine would actually take a tiebreaker over USD at 5-13 thanks to their win against Pacific. 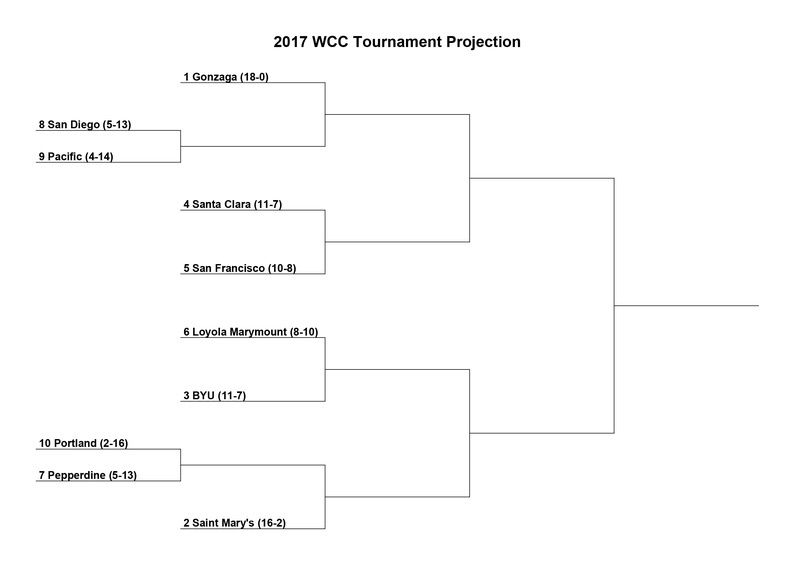 My last guess at a WCC bracket. Used your scenario above with the exception of LMU winning all 3 remaining games. Mostly because I didn't feel like breaking a 3-way tie between BYU/USF/SCU for third place. GU cruised past UOP 82-61. SMC won at BYU 70-57, as BYU was hit with injuries. USD got the upset at SCU 60-58 in double OT. That was not the win I predicted for the Toreros. And it hurts the Broncos' chance to pass BYU. That increases USD's changes of getting the #7 spot. A couple blowouts, a couple nail biters. SMC won at PU 78-49. PU and USD still tied at 5-12. PU hosts USF. I still predict that UP plays USD back-to-back. Otherwise, Dean's bracket is looking solid. BYU UPSETS THE #1 ZAGS! UNDEFEATED NO MORE! SCU and USF both have a 10-8 record. I think SCU gets the #4 seed. If so, Dean's bracket is correct. Almost correct, gotta switch up USD and Pepperdine in the 7/8 spots. Oops, I know USD was #7, just missed it on your bracket. Good job. SoundVoltex wrote: BYU UPSETS THE #1 ZAGS! UNDEFEATED NO MORE! GU 3 of 16 from 3Pt, and only 55% (missed 13 of 29) on FTs. Choke? up7587 wrote: GU 3 of 16 from 3Pt, and only 55% (missed 13 of 29) on FTs. Choke? Very few in the WCC like to see BYU win (probably something to do with the relative size of BYU compared to the rest of the WCC schools), but I for one am glad GU suffered its first loss to a WCC school rather than going out early in the NCAA Tournament and then both GU and the WCC taking grief for being a "weak" team in a "weak" conference. Definitely a dominate performance by Eric Mika (29 points and 11 rebounds), but even better, there were apparently a few NBA scouts at the game....hopefully they'll tell him he'll be drafted in the first round, and he'll leave BYU early . They were challenged late and sleepwalked. Geezaldinho wrote: Choke....They were challenged late and sleepwalked. Interestingly, Villanova lost at home to then #22 (now #11) Butler (their second loss to the Bulldogs this season), and did not drop in the polls. UCLA moved up with their win over then #4 Arizona in Tucson and Oregon stayed at #6 by winning twice at the buzzer in the Bay Area. With conference tournaments coming up, some teams in the top-10 are bound to lose (North Carolina and West Virginia lost tonight), but no doubt it's still imperative that GU win the WCC Tournament if they are to get one of the #1 seeds....hopefully in the west.